For the second time, Chaminade’s School of Business and Communications team took first place in a global case-study competition, hosted recently in Baltimore by International Assembly for Collegiate Business Education. Coaches Carolyn Kuriyama, Wayne Tanna and advisor Richard Kido took pride in their student team of Kiana Avalos, Chelan Crane, Darnell Fenderson, and Remi Kohno. The contest focused on business ethics to allow students to think on their feet, display skill at analyzing a case and recommending ethical action, and be team players. They chose a case with a Hawaii theme: Whether it was ethical of the state to develop the H-3 freeway through Halawa Valley while knowing desecrating ancient sacred Native Hawaiian sites. During the second round, they were asked to analyze a case on corporate tax inversions and propose a resolution within only four hours. 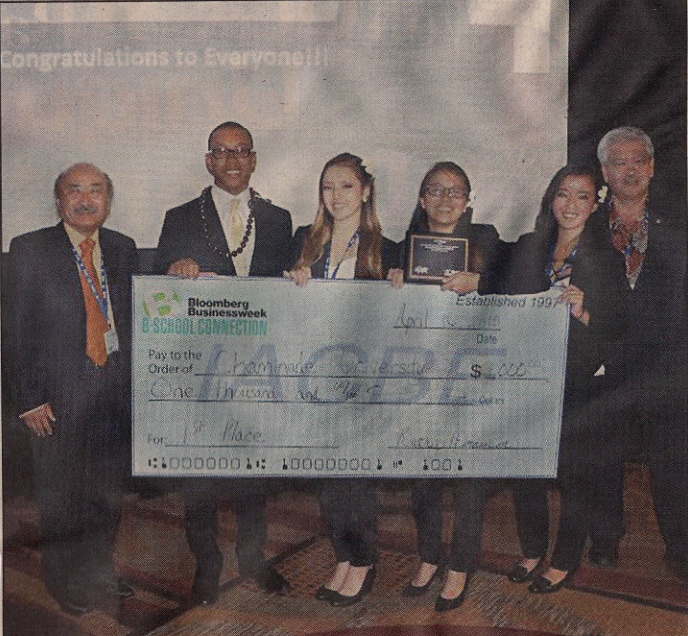 “It was a highly technical and complex issue,” Kido noted, “but the students were able to research the topic and come up with a great presentation” – and they were awarded a $1,000 scholarship, sponsored by Bloomberg Business Week. Chaminade University business students took care of business this spring in Baltimore, placing first in an international competition on business ethics and winning a $1,000 scholarship for the school. The team includes (from left) faculty adviser Richer Kido, students Darnell Fenderson, Chelan Crane, Kiana Avalos and Remi Kohno, and faculty coach Wayne Tanna. Three World War II veterans, two of whom served with the 442nd Regimental Combat Team, say they are honored that the French government is giving them its highest medal for helping to liberate the country but add that the decoration also belongs to all soldiers who fought and died there. “It’s an honor, but this medal belongs to all the soldiers,” said John Anusewicz, 91, who was a sergeant when he arrived in France with the 492nd Fighter Squadron five days after the Normandy invasion to assist in setting up one of the first airfields for the P-47 Thunderbolt fighter. “I got goosebumps,” said Anusewicz, who moved to Hawaii three years ago and lives in Kaimuki. Anusewicz was discharged after fighting in Europe for nearly three years, including supporting ground operations during the Battle of the Bulge. Attorney Pat Lee, honorary French consul in Honolulu, said three soldiers — Anusewicz and the 442nd RCT’s Henry Ishida of Aina Haina and Sueo “Sam” Fujii of Nuuanu — will be presented with France’s Legion of Honor medal and bestowed with the rank of knight Saturday morning at a ceremony at 15 Craigside retirement home. Lee said the medal also was approved for another 442nd RCT veteran, Fusetsu Miyazaki, of Eleele, Kauai, who died in February at the age of 100. The French government has been unable to reach Miyazaki’s family. Lee said guest speakers at Saturday’s ceremony will be Lt. Col. Dan Austin, the former commander of the 100th Battalion, 442nd Infantry Regiment — the Army Reserve unit at Fort Shafter that still maintains the colors of the World War II unit; French author, historian and resident of Bruyeres Pierre Moulin; and attorney Steven Edlestein, who has helped other veterans receive the award. The medals will be presented to the soldiers by Guillaume Maman, who is replacing Lee, the honorary counsel during the past 18 years. The two other veterans took no credit for themselves during interviews Friday at the Nuuanu condo. Ishida, a member of the 522nd Field Artillery Battalion of the 442nd RCT from 1941 to 1945, said he doesn’t think he did anything to deserve it. But he’s touched that someone would remember what happened so long ago. Ishida, 94, said he’s accepting the medal in memory of his friends. His family said Ishida was especially close to another member of the 522nd, Minoru Hirozawa, who introduced Ishida to his sister, Doris. The couple were married for 65 years. Doris Ishida died in 2014. Ishida, who graduated from Waialua High School in 1939, was among the soldiers who were given the title of “honorary Texan” for being a member of the 442nd RCT, which rescued Texas’ 36th Infantry Division, also known as the “Lost Battalion,” following the liberation of Biffontaine. Ishida’s unit also freed Jewish prisoners at the Dachau concentration camp. Fujii, a combat medic with the 442nd’s 3rd Battalion, said he is thankful to the French government, which initiated the award. “The medal is not only for me you know; it’s for all the people who backed us even during the war, after the war, and even today,” said Fujii, 90, who served in the 442nd RCT from 1943 to 1946. Fujii was captured by the Germans in 1944 after the battle to liberate the town of Bruyeres and spent six months as a prisoner of war. He volunteered to fight in 1943 after graduating from Kauai High School. 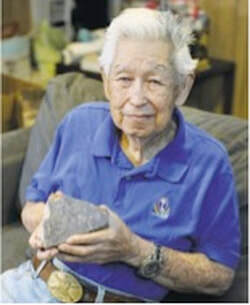 Henry Ishida holds a special World War II souvenir, a piece of Adolf Hitler’s house in Berchtesgaden. It is inscribed “From Berchtesgaden Hitler’s Home Ger - many 1945 Sanda.” Sanda is Ishida’s nickname. Uyeda Shoe Store in Moiliili is a third-generation family business that turns 100 this year and will relocate — but not for a while and not too far away. Claire Takashima's mother dug up an old picture of Claire's grandfather in the family's first store on Fort Street in Hono­lulu, which specialized in shoe repair. "That's an Edison light bulb," as in Thomas Edison, she said, pointing at a bare bulb in the photo. The family business was established in 1915 after Taka­shima's grandfather Sai­jiro Uyeda and grandmother Hatsuno immigrated to Hawaii from Japan. The couple's eight children grew up in and around the store. Because even the best shoes can be repaired only so many times, the decision was made to also sell new shoes. "My grandmother put a little showcase in the store," Taka­shima said, and over time, sales of new shoes supplanted the repair business. Fast-forward to today, and it doesn't really matter that Taka­shima is not very computer-savvy: Many of her customers are, so the small shop has a rating of 41⁄2 of 5 possible stars at online review site Yelp.com, with customers posting raves about the personal service and knowledgeable help received while there. You won't see any stiletto heels or gleaming red soles in Uyeda Shoe Store, the type of shoe Taka­shima calls "killers." Recording artist and actress Yvonne Elliman has been a customer for years and said she "could totally wear" one of the blingy, beaded Fit Flop sandals onstage, Taka­shima chuckled. The store sells stylish footwear intended to be comfortable and specializes in wide widths for Hawaii feet accustomed to wearing rubber slippers. It also is one of the few Oahu retailers selling Hoka One One athletic shoes. Additional brands include Teva, Merrell, Mephisto and Naot, to name a few. Other items include specialty socks and products focused on a healthy body, such as Kinesiology Therapeutic Tape, BackJoy seats for better alignment, and Hydroflasks, among other products. The shoes range from cas­ual footwear to athletic and hiking shoes to dress shoes for men and women with prices ranging from $55 to $350. There also is a 50 percent-off selection occupying shelving below the cash register. In the 1930s Uyeda Shoe Store moved to Palama and, in typical mom-and-pop-store style, the family lived upstairs until the war broke out and they had to relocate their residence. A home was purchased in Makiki, and later, the store, located on land owned by Walter Dillingham's Oahu Railway and Land Co., had to relocate to make way for redevelopment. The store opened in its present location in 1957. Takashima's late father, Yoichiro, was the eldest son, so at his father's direction he had taken the reins of the family business, aided by his wife, Kazue, who still is living. "She will be 98 in May. … She worked until she was 91, so this will be her seventh year of retirement," Taka­shima laughed. For generations the store sold shoes for the entire family, and "back-to-school was our busiest time," Taka­shima said, noting that the store was open from 9 a.m. to 9 p.m. After "my father got robbed," the decision was made to close earlier. In the month between the end of summer school and the beginning of the school year, Claire and her siblings all would work in the store, "and we took up all the chairs," she laughed. "If a customer came in, somebody had to get up," she said, still laughing. Whereas her father had been the eldest child and took over the business, Taka­shima is the youngest among her siblings — a sister and two brothers. "I always wanted to own my own business," she said, and jumped at the opportunity her father gave her in the 1980s to continue the family legacy. She not only had experience in the family's shoe store, but also had sold shoes at the old Liberty House stores in Wai­kiki and downtown. Her father had been supportive of that decision, she said; besides, "he wasn't going to pay me," she laughed. There is as yet no firm succession plan. When she took over she took steps to differentiate the store and was among the first on Oahu to specialize in selling shoes into which custom orthotics could be fitted. She started getting customer referrals from podiatrists, which remains a big part of the business. Traditional word of mouth also has long been a primary driver of the store's — you'll pardon the expression — foot traffic. Many of her customers' families also date back generations. Takashima is mulling over plans for a centennial celebration for the family business, and has quite a bit on her plate beyond party planning. The master lease for the property expires at the end of the year, and while extensions are possible, Taka­shima wanted certainty. So, when a retail space in the adjacent University Plaza became available right behind her current location, she bought it. At about 1,300 square feet, it is slightly larger than the roughly 1,100 square feet she currently leases. Takashima intends to vacate the current space by the end of the year and move into the space she owns, in University Plaza at 931 University Ave., almost directly back to back with its current location. Uyeda Shoe Store in Moiliili celebrates its 100th anniversary in business this year. Owner Claire Taka­shima, granddaughter of founder Sai­jiro Uyeda, holds samples of recording artist and regular customer Yvonne Elliman’s favorite shoes. 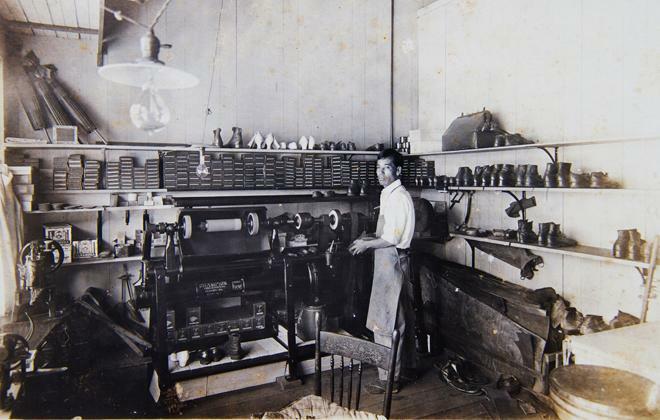 Uyeda works in the store’s original location on Fort Street, where it was open from 1915 through the 1930s.